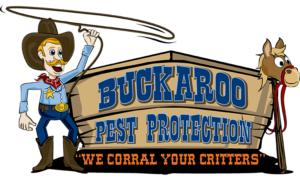 This policy applies to the information Buckaroo Pest Protection collects about you as a result of your use of the Buckaroo Pest Protection, the Site, the Services, and the websites operated by our partners. It does not apply to information about you collected through any related-website or any third party website or offering linked to or otherwise accessible from the Site. Please consult the privacy policies applicable to those sites and offerings. In connection with the use of theBuckaroo Pest Protection, the Site and the Services, we collect certain personal and non-personal information about you. We use this information to fulfill your requests; improve and manage the Site and the Services; personalize your experience on the Site; contact you; offer you products and services that may be of interest to you; if you so elect, to permit other registered users of the Site to contact you as discussed in Article V below; to permit you to access third party websites; and in connection with the various features of the Site that may permit you to input, post or provide information. We collect personal and non-personal information when you voluntarily provide it to us (for example, in the course of registration) and when you visit the Site. The information we collect about you depends on your use of the Buckaroo Pest Protection, the Site and the Services. Registration: There are many aspects of the Site that can be enjoyed as a visitor, but you need to register in order to utilize certain features and access certain content in the Buckaroo Pest Protection and to take advantage of many of the Services on the Site. Registration is entirely optional. In the course of registration, you are required to provide us with certain personal information such as your e-mail address and, if you elect to take advantage of the text message feature, your mobile telephone number. The information required to be provided in connection with registration is not made available to other users of the Site, unless you elect to do so. Business Information: Registered users of the Site may elect to also fill out an extended profile with business information to help us customize features for you. You may also opt to publish this business information in the Business Directory on the Site so other users can find you. Filling out the business information form and publishing in the Business Directory are entirely optional. If published on the Site, this information will be displayed to other users of the Site and other related country-specific Buckaroo Pest Protection websites. Registered users may also elect to create a personalized web page for their business. Special Note for Parents: This Site is a general audience website and not designed or intended to attract children younger than 13. We do not collect personal information from any person we actually know is younger than 13. We know how important it is to keep the personal information you’ve entrusted to us confidential. We will not rent, sell or share personal information about you with third parties except under certain circumstances as described herein. In all other cases, we will ask for your permission before we disclose your personal information. Affiliates and Partners: We may share the information you provide with companies and websites affiliated with Buckaroo Pest Protection and partners of Buckaroo Pest Protection (i) in connection with the Buckaroo Pest Protection, and (ii) to permit such companies, websites and partners to authenticate you on their websites and to personalize your experience on such websites. Disclosure for legal reasons: We may release personal information to third parties: (1) to comply with valid legal requirements such as a law, regulation, search warrant, subpoena or court order; or (2) in special cases, such as a physical threat to you or others, a threat to homeland security, a threat to our system or network, or cases in which we believe it is reasonably necessary to investigate or prevent harm, fraud, abuse, or illegal conduct. In the event that we are legally compelled to disclose your personal information to a third party, we will make reasonable efforts to notify you unless doing so would violate the law or court order. Agents and contractors: Contractors sometimes have access to your personal information in the course of assisting in operating our business and providing products or services to you. These contractors include vendors and suppliers that provide us with technology, services, and/or content for the operation and maintenance of our site. Aggregated, non-personal information: We may share aggregated information with third parties. This is information that is combined with the non-personal information of other users and does not allow you to be identified or contacted. Depending on the circumstances, we may or may not charge third parties for this aggregated information. We also may not limit the third parties’ use of the aggregated information. Changes in our corporate structure: If all or part of our company is sold, merged or otherwise transferred to another entity, the personal information you have provided at this site may be transferred as part of that transaction. Additional privacy policies may apply to specific Services or functionality offered through the Site or in connection with the Buckaroo Pest Protection. If you choose to register for or access any such Service or functionality, you will be presented with the privacy policies that are specific to such Service or functionality at that time. Your use of any such Service or functionality constitutes your acknowledgement and acceptance of such policies. Email communications: Email communication that you send to us via the email links on the Site may be shared with company representatives, partners or employees. From time to time, we may send you service-related emails, such as a welcome email when you register with the Site. Invitations; Email Articles: When you invite a friend to join the Site, we will automatically send your friend an email invitation on your behalf. We will not use your friend’s email address for any other purpose. Similarly, when you email a message or article to a friend, the email addresses are used to facilitate the email communication. Newsletters, promotions, alerts and reminders: At various places on the Site, you will be given the option to receive recurring informational newsletters and promotions and to set alerts and reminders. You have the ability to opt-out of the receipt of newsletters, promotions, alerts and reminders. Private messages: Private messaging enables you to send emails through the Site forums to other registered Site users without revealing your email address. Only your nick-name (the nick-name you select for yourself when you register) will be visible to recipients of the email. We will not share your email address with other users unless you choose to make it viewable by others. You have the ability to not participate in private messaging and to opt-out of the receipt of private messages. Text messages: Upon registration with the Site, you may be given the opportunity to register to receive periodic announcements, alerts, notices and other text message communications relating to the Buckaroo Pest Protection. You are not required to agree to receive any text messages and, if you have previously indicated your desire to receive text messages, you have the ability to opt-out of the receipt of such text messages. The Site features areas where people with similar business interests can share information and support one another. Please remember that any information that you post in public areas is, by design open to third parties. Forum and chat postings and comments: By default, when you post to a forum your post will be associated with your nick-name. We maintain administrative, technical and physical safeguards for the Site to protect against unauthorized disclosure, use, alteration or destruction of the information you provided on this site. You can edit your Account Profile information, including your Site preferences, at any time. We may provide links to other websites, including, without limitation, those of our partners and affiliates, for your convenience and information, including, without limitation country-specific Buckaroo Pest Protection sites. These sites operate independently and may have their own privacy policies, which we suggest you review if you visit any such linked site. To the extent you visit any linked sites, including, without limitation, those of our partners and affiliates, we are not responsible or liable for their content or accuracy or for your use of such sites. Please be aware that information we collect about you may be transferred to the United States or other countries for processing and storage. By using the Buckaroo Pest Protection, the Site and the Services, you consent to this transfer, processing and storage of your information.